Strong performance in 2017 with sales up 346% on 2016: Mark Grotjahn’s market showed signs of strength in 2017, with total auction sales of $32.4 million and increasing by 346% from the total sum generated through sales in 2016. New auction record prices for Mark Grotjahn in 2017: A new auction record price for Mark Grotjahn was set at $14,750,000 (hammer) in May 2017, for Untitled (S III Released to France Face 43.14) from 2011. The painting was sold through Christie’s Post-War and Contemporary Evening Sale in New York and offered with estimates of $13 – $16 million and a third-party guarantee. 53% increase in the number of lots selling above $750,000 in 2017: Seven lots sold above the value of $750,000 in 2017 (44% of total lots sold) increasing by 53% from 2016. 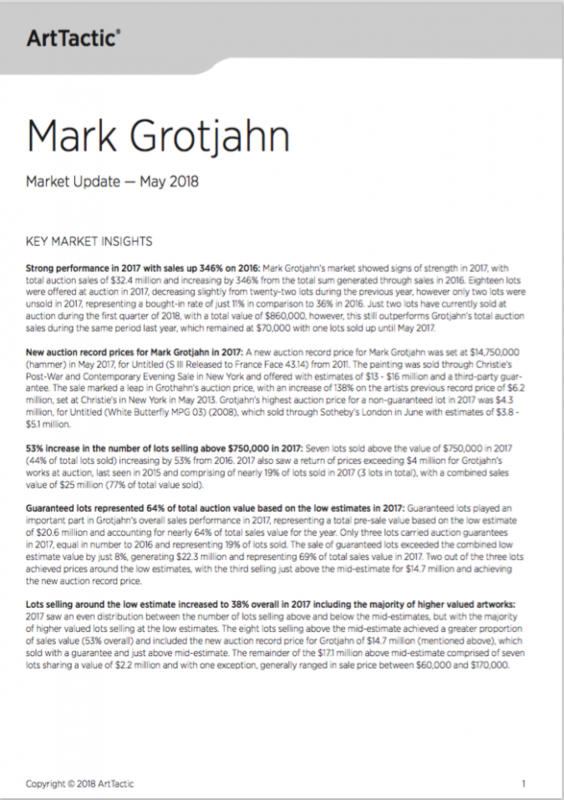 This Market Update follows on the Mark Grotjahn Market Report published by ArtTactic in May 2017. ARTWORK SERIES FOCUS: FACE PAINTINGS & BUTTERFLY WORKS.